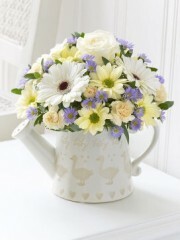 Stonehaven Flowers know that there is no better reason to celebrate than to welcome the arrival of a new baby. It is a time of joy and satisfaction, for family and friends alike, so our florists in Stonehaven have crafted this selection of wonderful gifts and flowers to offer something which suits all tastes. With gift options for the baby boy and his parents alike, Flowers Stonehaven believes that we can offer you whatever you might be looking for. Flowers are always a reliable gift to express how you might be feeling, which is why they are perfect for showing the new baby and his parents just how much you appreciate them. 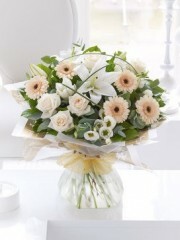 Both congratulations and welcome are sentiments which are in order for the arrival of a new baby, and you can count on the flowers which the florists in Stonehaven provide to convey this for you. The Stonehaven florists have over 40 years of experience in the floristry industry, which means you can count on us for high quality gifts and flowers for your delight. The florists in Stonehaven use only the freshest flowers for all of our flower arrangements, so your baby boy gift will stay as glorious and breath-taking for a good period of time. 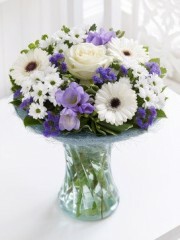 The florists would be delighted to hear from you should you have requests or queries concerning your special order from us. If you cannot find anything to suit your tastes in the baby boy gift and flowers collection, feel free to consult the bespoke flower arrangement service which Flowers Stonehaven offers. 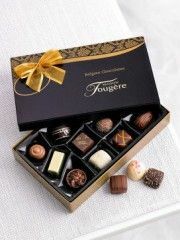 This ensures that whatever you might want, we can craft a beautiful, unique and personalised gift for you. We would be delighted to hear from you should you have any feedback for us, as we know that it will only help us to improve the service we provide. 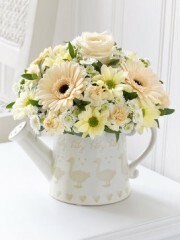 Gorgeous baby boy gifts and flowers are available from Stonehaven florists today. Here at Stonehaven Flowers our priority is your satisfaction, which is why we are delighted to customise our services to your needs. The beautiful selection of gifts and flowers available from Flowers Stonehaven are aimed to match the beautiful baby boy they are made for. The florists in Stonehaven are able to provide a fantastic flower delivery service in Stonehaven and the local area, meaning that your lovely baby boy gift can be delivered with speed and efficiency. Furthermore, it is easy to specify a delivery day which suits you, as the flower delivery service operates six days a week, from Monday to Saturday. 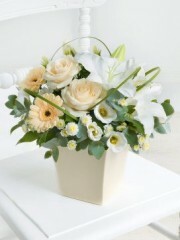 It is also simple to get in touch with our friendly team and state whether you would like your baby boy flowers to be delivered in the morning or afternoon. Stonehaven Flowers also offers a same day delivery service provided that your order is placed with us before 3pm of the day in question. Flowers Stonehaven is proud to be part of the Interflora brand, which means that by ordering with us in Stonehaven, your baby boy gift can be delivered to many locations. Interflora provides flower delivery services to a huge range of locations across the United Kingdom and even abroad, as they offer flower delivery services internationally in 140 different countries across the world. 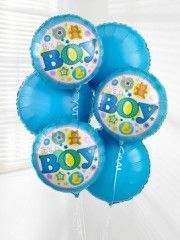 Ordering a beautiful baby boy gift is easier than you think with Stonehaven Flowers. 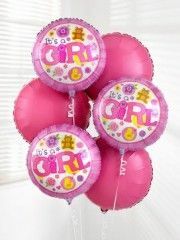 A new baby girl is a magnificent reason to celebrate, and Stonehaven Flowers is on hand to help you with gorgeous flowers and gifts. We know that the beautiful baby girl and her new parents deserve to be showered with love and affection, and ordering flowers from the florists in Stonehaven is the perfect way to do that. We believe that flowers are a wonderful way to convey your sentiments of care and congratulations, so do not hesitate to order high quality flowers from us today. The new baby girl in your life deserves only the best! The florists in Stonehaven use only the freshest flowers on offer for all of our flower arrangements, so you can count on us to deliver vibrant and crisp flowers which will carry on looking beautiful for a number of days. Stonehaven florists have over 40 years of experience in the floristry industry, so your baby girl gift will be crafted with exceptional care and skill. The florists would be delighted to hear from you should you need any advice or desire to register any specific requests you might have. The wide range of gift ideas available in the baby girl range are varied in style, colour, design and price, meaning that the florists in Stonehaven are confident that you will be able to find something to cater for a range of tastes. However, if you cannot find what you’re looking for amongst our selection or you have a very specific idea of what you want, feel free to consult the bespoke flower arrangement service which Stonehaven Flowers provides. This way, your baby girl gift will be as personalised and as original as you desire. The dedicated team here at Flowers Stonehaven will oversee your order with close attention, making sure that you are satisfied with your safely delivered flower gift. 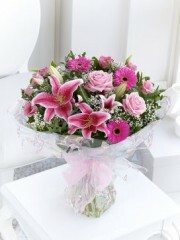 Order a beautiful baby girl gift for a lovely baby girl from Stonehaven Flowers today. The baby girl flower and gift selection available from the florists in Stonheaven is one created with style and taste, so that you will be satisfied with a beautiful flower arrangement. Stonehaven Flowers are dedicated to upholding the highest standards possible, and you should expect no less from the baby girl selection. We want to make sure that this time of celebration is made only more pleasant with your order from Flowers Stonehaven, which is why we tailor our service around you and your specific needs. The florists in Stonehaven operate a reliable flower delivery service in Stonehaven and the surrounding local area, ensuring that your baby girl flowers are delivered safely and on time to you or your recipient. 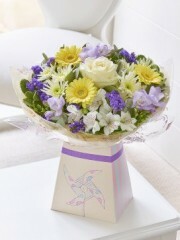 Stonehaven florists also offer a same day delivery service on all orders placed with us before 3pm on the day in question. It is also possible for you to request a specific day of delivery, as the flower delivery service operates from Monday to Saturday, and stating whether you would prefer morning or afternoon is also simple. All you have to do is contact the friendly team at Stonehaven Flowers. 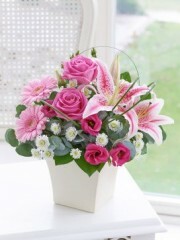 Flowers Stonehaven is part of the Interflora brand, meaning that when you order with us in stonehaven you are by no means limited by distance for you flower delivery service. A huge number of locations are available for flower delivery across the United Kingdom, and international flower delivery services are also available in 140 different countries across the world. 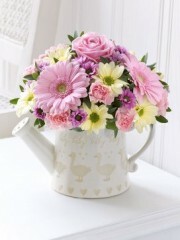 Make a wonderful decision by ordering a fabulous baby girl gift from Stonehaven Flowers today. A new baby is one of the happiest and greatest celebrations there are, Stonehaven florist know the importance of such a great time of new life and new beginnings. Stonehaven florist have a great selection of flowers, balloons, champagne, chocolate and teddies that all make fantastic gifts to give to the new parents or grandparents at this memorable time in everyone life. 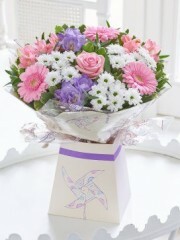 Send something lovely that shows your congratulations to the beginning of a new life, Stonehaven florist can create bouquets of pinks for a baby girl or blues and purples for a little baby boy. 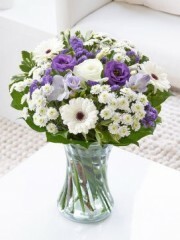 Sending gifts at such an exciting time for everyone so you want to make sure you chose the right thing, after you have made the difficult decision of what to send you can leave the rest up to us, we will take care of those small and important details from arranging the flowers to beautifully gift wrapping them, all our bouquets come in water to ensure a long life for your flowers and a freshness that will mean the flowers can be enjoyed to their full potential. 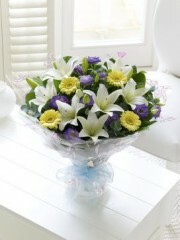 Stonehaven flowers offer a fantastic same day delivery, next day delivery and of course delivery date of your choice. However if you have heard a friend or loved one has had their baby and want to send flowers as soon as possible same day delivery might be the best option from Stonehaven flowers.